This is based on a great Life Pro Tip from Reddit. That tip was from the point of view of an airman in the Air Force learning from a fighter pilot how to manage stress. I’ve adapted it for a middle school audience. It’s very common to think of stress as a feeling, but this isn’t right. Stress is a biological response. It’s your body’s way of telling you to fix something that’s wrong. Some of the things the body does when under stress are: gain weight, have trouble falling asleep, increased blood pressure, acne, hair loss (hopefully not in middle school), etc. Lots of times people deal with stress by trying to do things that feel better: yoga, working out, or getting stress balls to play with. These don’t remove the stressors that are causing the problems, so the problems don’t go away. Please note: I’m not saying that yoga, working out, and stress balls are bad. Just that they don’t remove the causes of stress. They can help you manage stress, and help you calm down enough to identify your stressors (see below). Think of stress like financial stress; that’s when your bills are high and you don’t have enough money to pay them. No stress ball will help you pay your bills if you don’t have the money. Stress stacks up. 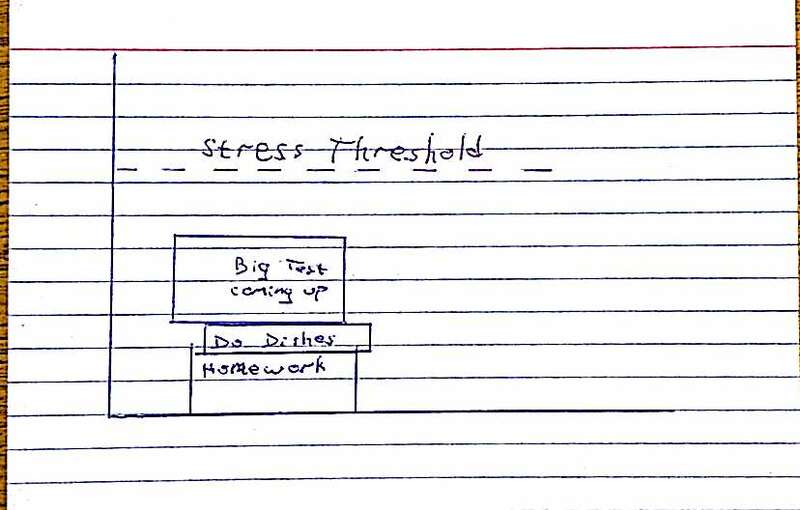 Think of a graph with a horizontal line that represents your personal stress threshold. Everything you do in life is a stressor. They’re like blocks that stack up one on top of another, getting closer to that line. Some blocks (studying for a big test) are bigger than others (doing the dishes), but each one gets you closer to the breaking point. The closer you get to your threshold, the more stressed you feel. If you don’t deal with your stress, the blocks can cross the threshold. At this point, you become depressed, which is your body’s way of saying “you’re not dealing with this, so I’m just going to shut down and hope the stress goes away”. First, make a list of everything that stresses you out. Take care of anything on that list you can do something about now. This makes the list smaller, and lightens your load. It really will feel like you’re carrying less when you do this. We have the metaphor of “carrying a load” when we feel stressed. Knocking things off of that list of stressors helps that burden feel lighter. It could be doing homework, studying, or finding out why your best friend has been giving you the silent treatment. It’s the doing something to reduce the number of stressors that’s important. While having ice cream, or eating chocolate, or playing video games may feel good, it doesn’t actually do anything to lighten the load. Taking action to reduce your stressors—studying, doing your homework, etc.—will knock some of those stress blocks down and make more room below the stress threshold. Keep that list in mind, and do what you can to do things to remove them from the list. Residual Stress (AKA Emotional Baggage): This is stress from something that happened in the past. You can’t do anything about these, you’re just stuck with them. Maybe you were teased a lot in the 3rd grade, or you messed up in the band concert and everyone knows it. It’s embarrassing, but it’s over and done with—you can’t do anything to make it so that it never happened. What you can do is try to get past it, by not letting it bother you anymore. Easier said than done, I know. Recurring Stress: This is stress that keeps coming back. It could be a chore that you have to do every day or every week; maybe it’s your job to take out the trash every day or vacuum the carpets every Saturday. Homework is a recurring stress. So is studying for quizzes; you know there will always be another quiz coming up soon. These can build up if you don’t take care of them quickly. This is a reason to do your homework right away when you get home. Time Sensitive Stress: This is something that you need to do, but can’t do right now. Maybe you’re worried about stage fright when you’re on stage in the upcoming play. You can learn your lines, but you can still be worried about freezing on stage. Do what you can to prepare for it and take care of the other types of stress, so you stay far below the stress threshold. What’s happened in the past is over; you can’t change it. You can choose what you do now, in the present. The choices you make now will affect what your future will be like. For example: Right now I’m not prepared for the Social Studies test on Ancient Mesopotamia. If I don’t do anything I’ll fail, and I’m anxious because of it. But, if I study, and reread the section, and ask the teacher for extra help, I’ll do better on the test. I’m changing what my future is going to be (from failing to getting a B on the test). Do what you have to do to reduce your current stressors. Do your homework. Practice your instrument. Do your chores at home. Learn your lines for the play. Review your notes and find out what you need help with. Study for the test. As you do these things, you will reduce your amount of stress, and you will feel better and more in control.